We envision state parks that reflect Montana's renowned outdoor recreation and heritage for all... forever. The Montana State Parks Foundation is the official nonprofit fundraising partner of Montana State Parks. Montana's unique outdoor recreation culture and spectacular natural assets deserve a park system that is world-class.Yet for years, government funding has fallen far short of delivering the high-caliber system of parks and front country recreation amenities that Montanans deserve. The Montana State Parks Foundation helps bridge that gap. We are a 501c3 dedicated to helping Montana's state park system become one of the best in the nation through private fundraising and capacity building in areas where government funding is simply not enough. The Montana State Parks Foundation raises private support to enhance the visitor experience and build advocates for Montana's state parks and recreation heritage. The Montana State Parks Foundation was incorporated August 2015. We’ll be expanding our board to provide more depth and regional expertise in the near future. Four generations of descendants before Coby have found balance working and living with the incredible landscapes that make Montana the "Last Best Place". A western Montana transplant from the wide open spaces near Miles City and Glendive, Coby brings years of innovative public lands conservation experience gained through work with four National Parks, the U.S. Forest Service, the Montana Conservation Corps, and several conservation non-profit organizations to his role with the Montana State Parks Foundation. As a strong proponent of partnership and cooperation amongst land management agencies, local businesses, and community-backed groups, Coby is working to achieve the shared potential of Montana's State Parks and communities. As a graduate of Portland State University, Coby has spent his entire young adult life as a professional and personal advocate of public lands and wide open spaces. You can find him on his raft, snowboard or mountain bike all across Montana often with his wife and young-at-heart pup in tow. As the Executive Director of Visit Billings, Alex deeply appreciates and understands the significance of tourism in southeast Montana and the impact parks have on the Billings’ economy. In fact, parks are literally in her blood. Born in Yosemite National Park, Alex also lived in other national parks including Crater Lake and Yellowstone. One of her first jobs was scooping ice cream for visitors at the old Hamilton Store in Mammoth Hot Springs. Prior to her work with Visit Billings and the Billings Chamber of Commerce, Alex anchored and produced "Montana This Morning" for CBS affiliate KTVQ. A 24-year resident of Billings, she is a graduate of MSU-Billings and has served as past president of the MSU Billings Alumni Advisory Board, as a board member of the Billings Education Foundation, MetraPark Advisory Board and Big Sky State Games along with state tourism associations including Voices of Montana Tourism. For 24 years, Alex has proudly called Billings her home with her husband Calvin and their two children. Author of "The Lewis and Clark Companion" and "Why Sacagawea Deserves the Day Off," Stephenie has written numerous articles and books on Western history. As the daughter of late historian and National Geographic Explorer-in-Residence Stephen Ambrose, author of "Undaunted Courage"—the renowned chronicle of the Lewis and Clark Expedition—Stephenie literally grew up on the Lewis and Clark Trail. Her passion for conservation and resource preservation has led to her serving on various boards and councils including the Lewis and Clark Trust, the American Prairie Reserve and the Montana Preservation Alliance. Diane's law practice focuses on real estate, business, water, and environmental law. She uses her wide-ranging skills to guide individuals and businesses through the complexities of residential, commercial and conservation real estate transactions. A founder of Whitefish Legacy Partners, Diane's vision helped this nonprofit conserve over 2,000 acres of public and private land and build over 30 miles of recreational trails on the outskirts of Whitefish. This $14 million, 10-year project has resulted in an internationally recognized mountain bike trail system and thousands of acres of land to roam only a few short miles from town. Writer, speaker, entrepreneur, and leader, Jeff founded and built his marketing agency, MERCURYcsc into a leader in connecting brands with people who value travel, the outdoors, and a sense of place. His triple-bottom-line approach to doing business has landed MERCURYcsc in Outside Magazine’s Best Places to Work for five consecutive years. He also serves on the governing board of the Montana State Parks and Recreation and the advisory board of Sustainable Travel International. He lives with his wife and two children on their small farm in Montana's Shields Valley. Terry was born and raised in Miles City, MT. He briefly attended Miles Community College, North Dakota State University before enlisting in then US Navy. After his naval service, he earned his bachelor's degree from the University of Montana and a law degree from the University of South Dakota. He began his professional career with a short stint as legal service attorney in eastern Montana, followed by Head Counsel for the Montana Public Service Commission in the early 70s while the Colstrip power plant was still in development. He was a Deputy County Attorney fir Flathead County for about a year before establishing a private practice in Miles City which he has operated for over 40 years. Terry is a former member of Board of Directors of Montana Trial Lawyers for 10 years and a 45 year member of Northern Plains Resource Council. Terry loves spending time outdoors, particularly with the oars of his raft in hand while navigating white water stretches of river in the northwestern US. Tanner’s career has tracked her passions — exploring outdoor spaces and helping others get outside and dive into life. As a child she and her family lived in remote western Montana areas, sometimes off the grid. She grew up as an outdoor kid, and has rafted, hiked and biked in the Northwest as well as in Central and South America. At work, Tanner combines her commitment to open spaces with her IT skills — she spent 15 years with a multi-state chain of outdoor sporting goods stores, in positions including Director of IT and Director of Operations. She is now a project manager with the ZaneRay Group, a Whitefish ecommerce and design firm that has many clients in the outdoor industry, and also supports conserving and preserving our public lands. Tanner has lived in the Flathead Valley since 2001, and she is dedicated to helping preserve the open spaces and recreation opportunities there and throughout Montana. When she isn’t working, you’ll find her on a trail, a river or a ski run. Chris, originally from Pittsburg, PA, made his way west as soon as he could to begin a long career in public lands and wildlife management from Alaska to Montana. 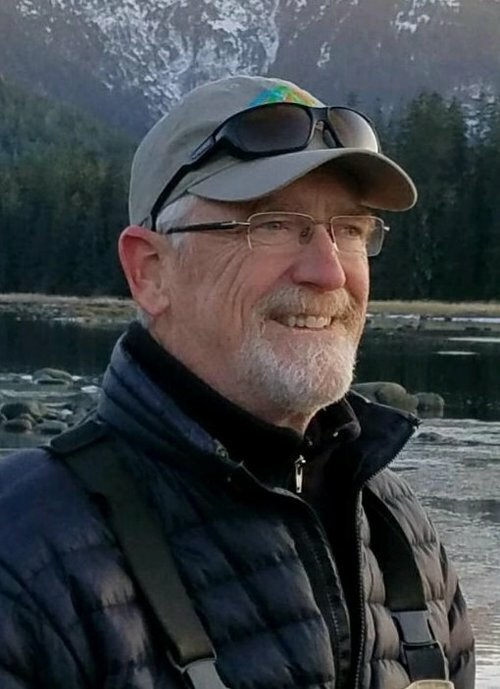 Chris has over 34 years experience in planning, management, research, supervision and administration of resource conservation programs throughout Alaska and Montana. He has extensive involvement with the Association of Fish and Wildlife Agencies, Western Association of Fish and Wildlife Agencies and inter-agency teams. Chris has specialized training and experience in wildlife policy and law, public involvement, conflict resolution, personnel management, and strategic planning. Chris served as Deputy Director for the Montana Department of Fish, Wildlife, and Parks for 11years. Prior to working in Montana, Chris worked for the Alaska Department of Fish and Game. In his 23 years working for Alaska, he rose from Fisheries Technician to Assistant Director of the Division of Wildlife Conservation. Chris holds a B.S. Degree in Wildlife Management from the University of Alaska and a M.S. Degree in Wildlife Biology from the University of British Columbia. Charles Besancon is a recreation planning, policy and finance specialist. He has held staff positions in these and other international organizations including as the Head of the Protected Areas Programme at the UNEP World Conservation Monitoring Center and Coordinator of the LifeWeb Initiative at the Secretariat for the Convention on Biological Diversity. He has lived on 3 continents and has worked and travelled in more than 65 countries mostly helping developing country governments with the increasingly technical and demanding requirements of managing and funding their protected areas systems. Prior to this international work, he was a wilderness ranger for the US Forest Service and with the Arthur Carhart National Wilderness Training Center developed Wilderness.net for the US Forest Service, Park Service, BLM and Fish and Wildlife Service. He currently lives in Missoula Montana and works as a free-lance consultant. The focus of his current work is to provide training and facilitation services for visitor use management planning and the development of strategic plans and protected area management plans internationally but also closer to home in the USA and Montana. Before founding Blackmore Group, LLC, Schimbeno attended Montana State University-Bozeman and the University of Montana in Missoula, MT. Schimbeno formed Blackmore Group, LLC and began working full-time following his graduation in May 2015. The experience Schimbeno gained while working for two startup companies has been invaluable and integral for his success in starting Blackmore Group, LLC. Schimbeno’s familiarity with the challenges of starting a new business has proved valuable as he conveys his knowledge and experience to the growth of the Foundation. Schimbeno’s passion for helping his customers is match by his desire to protect and improve Montana’s State Parks. When he’s not busy running Blackmore Group, Brock and his family enjoy mountain biking, hiking, and exploring Lewis and Clark Caverns State Park. Eric Siegfried is the Founder of onX, the first land data company of its kind designed to provide comprehensive maps to hunters, fishermen, and anyone else who recreates outside. You might think of Montana's 55 state parks as "our parks". While we are blessed to have Glacier National Park, Yellowstone National Park and numerous other federal lands to enjoy, no other entity represents the full spectrum of the Montana experience like Montana State Parks. They are used by and designed for Montanans, by Montanans and include world-class recreation opportunities, some of our most important historic sites, and a fantastic representation of many facets of Montana culture. Montanans agree. State parks hosted nearly 2.5 million visitors in 2015; that’s more than double the number of visitors than just a decade ago. Montanans of all ages, incomes and interests accounted for 80% of those visits—because Montana's state parks are for all of us. Parks are popular, front-country experiences that help us get outside and enjoy Montana's one-of-a-kind outdoor heritage. For more information, visit the Montana State Parks website.